Some more on the SSPX perspective. The German Superior of the Priestly Fraternity of St. Pius X, Franz Schmidberger, has defended the ordination of new priests planned for the coming weekend. In an interview with the Catholic News Agency (KNA), Schmidberger also commented on his assessment of the Second Vatican Council and what he expects from further discussions with Rome. KNA: Herr Schmidberger, are you a priest of the Catholic Church? Schmidberger: Of course. 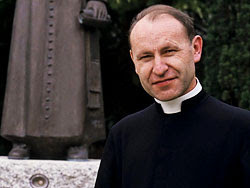 I was ordained to the priesthood in 1975 by Archbishop Marcel Lefebvre in Econe. KNA: You say that without any qualifications? Schmidberger: Yes. I live and work in the heart of the Church. KNA: What does the Second Vatican Council mean to you? Schmidberger: There is no doubt that it was an ecumenical council, but among the 21 councils it possesses a unique status as a pastoral council. Both popes of the council declared that they wished to define no new dogmas. Therefore, the Second Vatican Council does not have the same status as the other councils. KNA: What about its content? Schmidberger: The spirit of the council has been described as an evil spirit, even by Pope Benedict XVI. There are ambiguous statements in the documents, and many others that do not agree with traditional doctrine. KNA: What should the theological dialogue between the society and Rome regarding the council look like? Schmidberger: As far as the external form goes, it could be both oral or written, but primarily it should be written. We have selected representatives from our side and Rome also has chosen its people. The discussions will consider: what is ambiguous in the council? What contradicts the traditional doctrine of the Church? KNA: Frankly, do you believe that the old and new rites can continue to coexist over the long term? Schmidberger: Well, we will have to see how things develop. There are profound differences between the two rites; for example, the direction of the celebration. The old rite is God-centered. The new is man-centered. Many of the gestures, symbols, and rituals have been fundamentally changed. Today, the old rite is like a solid rock amidst the pounding surf, that must remain unchanged. The new rite requires radical reworking so that the sacrificial nature is once again explicitly expressed. KNA: What does the Society think of the Council's Decree on Ecumenism [Unitatis Redintegratio]? Schmidberger: It says that other [Christian] denominations are means of salvation. If that is true, then there is no longer any point in engaging in missionary activity. That needs to be cleared up. KNA: What about Nostra Aetate, which concerns the relationship with the Jews? Schmidberger: Not only the Jews, it also concerns Islam, Hinduism, and Buddhism. These non-Christian religions are heaped with praise. This has encouraged the expansion of Islam, for example. Today there are 4.3 million Muslims in Germany. The Church has a mandate to work for their conversion, but I do not know of a single German bishop who has made any plans to do so. As far as the relationship with the Jews goes, the statements of the Council cannot be criticized in their essence. But, since the Council, the idea keeps popping up that the Jews have their owns path to salvation. That is completely opposed to the missionary command of Jesus Christ. KNA: And you also have problems with the description of the Jews by Pope John Paul II as the older brothers of Christians. Schmidberger: Certainly Abraham, Isaac, Jacob and the prophets are. But the Jews of today are not, because they do not recognize Jesus Christ as the one and only redeemer. How could they then be older brothers? KNA: Is the impression correct, that you, with your positions, wish to set the price for unity with the Catholic Church. Schmidberger: We want the truth to triumph. It has nothing to do with subjective opinions, it is all about the truth. KNA: As you define it. Schmidberger: No, we read all of the previous statements of the Councils and the popes. Pope Pius IX spoke out against religious freedom, for example. The question is: do these false religions possess natural rights? The Second Vatican Council answers differently than Pius IX. That is a rupture. KNA: Canon law requires priests to submit to the local bishop. Why is that difficult for you? Schmidberger: It isn't difficult at all. But we are our own society, that was even praised by Rome in 1971. Afterwards, we developed our own life. Then tensions developed because we refused to participate in the destructive protestantizing reforms. We have questions about the faith of the Church and the bishops only respond by demanding obediance. But faith is superior to obediance. KNA: In connection with the Williamson scandal, Pope Benedict XVI accused the SSPX of arrogance and urged you to refrain from provocations. But the opposite has happened. How can you help to put the pieces back together? Schmidberger: Naturally, every man has his weaknesses and unfortunate things have been said. But we want to live together peacefully. I have written a private personal letter to the chairman of the bishops conference, Archbishop Zollitsch, but the bishops are not willing to engage in discussions. They reject any dialogue with us. Why do they demand that we obey canon law to the letter while at the same time they assert that we are outside the Church? KNA: In 2005 there was a conversation in Castel Gandofo, in which, in addition to the Pope, curial Cardinal Dario Castrillon Hoyos, and Traditionalist Bishop Bernard Fellay, you also took part. What was agreed at that time? Schmidberger: We discussed the entire situation with the Society and agreed on the path which we are now following. The Motu Proprio of 2007 and the lifting of the so-called excommunications were the first steps. Now comes the theological dialogue. Next, we have to find a canonical structure for the Society with its 500 priests. We are satisfied with the solution that Rome is considering. Schmidberger: In the direction of a personal prelature. KNA: Similar to Opus Dei? KNA: More ordinations are planned for the coming weekend, although Rome has said that they are illict. Why do you insist on these ordinations? Schmidberger: The supreme law of the Church is the salvation of souls. The faithful have a right to the celebration of the traditional form of the Mass. The point is making priests who desire to proclaim the Gospel available. The ordinations are not meant to be an affront to anybody. They are actually being done to help the Pope and the bishops. But it like dealing with patients who do not see what medicine does for their health. KNA: And so you claim the role of physician. Schmidberger: Yes, that is true. Tradition is the only guide to bringing the Church out of the present crisis. In 1950, 13 million Catholics went to Sunday Mass. Now it is just under 2 million. That is a drop of 85 percent. In ten years, all of the Churches will be empty. Is that what the bishops want? What is going to happen to our children? It is about preserving Christianity in the West.